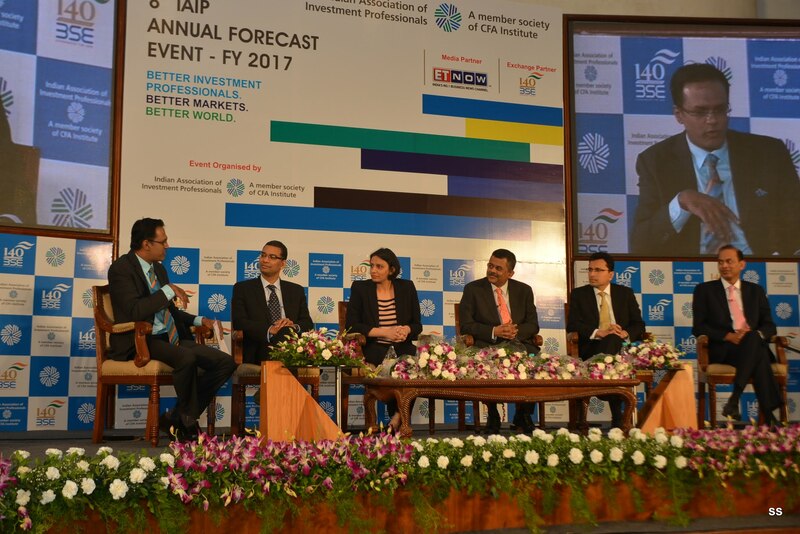 The 8th IAIP Annual Forecast Event FY2017 was held on 1 April 2016 at the BSE International Convention Hall, Bombay Stock Exchange, Mumbai. Kishor Bagri, CFA, Director, IAIP, kicked off the evening’s proceedings with an overview of the fiscal year 2015-16. He pointed out that the domestic economic scenario was improving as evident in cement and infra projects pick-up but corporate leverage remained high along with rural distress. Globally, most countries were witnessing a slowdown with many emerging indices posting negative returns. Jayesh Gandhi, CFA, President, IAIP gave an overview of IAIP’s work through the year. He highlighted that the survey indicated that while most Indians trust investment firms, an increasing number are seeking greater transparency and ethical conduct. Shankar Jadhav, Head of Strategy, Bombay Stock Exchange (BSE) opined that business has grown well in the past few years. BSE, well supported by the government of India, has done its bit towards growing the Indian economy by enhancing research capabilities, improving transparency and regulating markets well. Kishor then introduced the power-packed panel which consisted of Sunil Singhania, CFA, CIO – Equity Investments, Reliance Mutual Fund; Mahesh Patil, Co-CIO Birla Sun Life AMC; Neelkanth Mishra, MD and India Equity Strategist, Credit Suisse; Sonal Varma, Executive Director and Chief India Economist, Nomura India; and Paritosh Mathur, Executive Vice President, IDFC Bank Ltd. Nikunj Dalmia, Chief Editor – Financial Markets, ET Now moderated the panel. Sunil reiterated that the Indian economy will double to $4tn in the next six to seven years which will auger well for equity markets. He is positive on financials and consumption related stocks. Mahesh opined that cement volumes, auto sales numbers and some areas in Infrastructure and consumption have started to see a pick-up. Neelkanth would prefer to stick to bonds on a one-year time frame and expects equities to outperform all asset classes over a five year tenure. Domestically, Sonal believes that real estate macros are in a bad shape, which can lead to massive price correction or extended time correction. Inflation will be sticky and the RBI is expected to cut 25 bps of repo rate. Paritosh Mathur, Executive Vice President, IDFC Bank Ltd.
Paritosh is of the view that supply of bonds will be there at the longer end of the yield curve whereas the shorter tenure yields would dip below 7%. Kishor concluded the event by announcing the winners of the FY16 predictions. This entry was posted in Annual Forecast, Events, Mumbai, Panel Discussion and tagged Aditya Jadhav CFA, Anil Ghelani CFA, Annual Forecast Event, Archit Lohia CFA, Birla Sun Life AMC, Credit Suisse, IDFC Bank Ltd., Jayesh Gandhi CFA, Kishor Bagri CFA, Kunal Sabnis CFA, Mahesh Patil, Namit Arora CFA, Neelkanth Mishra, Nomura India, Paritosh Mathur, Reliance Mutual Fund, Saurav Mishra CFA, Sonal Varma, Sonia Gandhi CFA, Sunil Singhania CFA. Bookmark the permalink.